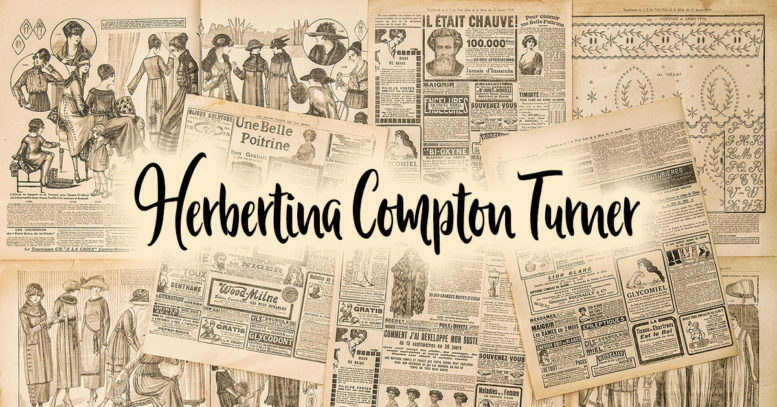 Herbertina Compton Turner was W.S. 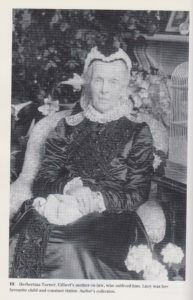 Gilbert’s mother-in-law. A frequent visitor to Grim’s Dyke, Herbertina got on very well with Gilbert. During her life, Herbertina witnessed her own share of heartache, something I’m sure she was able to draw upon, as she helped her daughter Lucy through the subsequent death of W.S. Gilbert. Born on the 2nd July 1815, Herbertina was born into a distinguished family. Her father, Sir Herbert Compton, had worked his way the ranks. Starting as an enlisted soldier, he became Lord Chief Justice of Bombay and was knighted in 1831. Her brothers continued the tradition, with both of them working in the Indian Civil Service. Herbertina Compton married Thomas Metcalfe Blois Turner on 24th January 1835 at Bombay Cathedral, Bombay, India. Thomas was a Captain in the Honourable East India Company Engineers. Together, they had seven children, all of whom were born in India. Unfortunately, the couple faced early heartache, as their three youngest children didn’t live very long. Henry was born first – alas, he died just after a month later. Thomas was born a year later, with Anne being born a couple of years after Thomas. But heartache wasn’t far away. Anne died within a day or two of being born – and they lost Thomas just over a year later. A year later Grace was born (1840), followed by Herbert (1842) and Samuel (1845). However, Herbertina suffered more heartache – but this time it was her husband, Thomas. He died on 9th July 1847. During the next few months, a pregnant, widowed Herbertina returned to England. She was accompanied by her brother-in-law, Henry. He went on furlough, so he could accompany a pregnant Herbertina back to England and stayed to help her out for the next four years. She settled in Suffolk, giving birth to her final daughter, Lucy, in Yoxford, on the 14th November 1847. Lucy was her favourite child and perhaps this is understandable, not only because Lucy was her youngest daughter, but maybe because she was the final child she had with Thomas. They subsequently moved again, just before Lucy turned 5 years old – moving to Victoria Road, Kensington, London. Herbertina was a constant visitor to Grim’s Dyke but lived in her own home. According to reports, her décor was fascinating. Full of Indian relics, brass and copper bowls, rugs and masses of brass trays. By all accounts, Herbertina was just as fascinating as her décor. She loved to wear black silk dressing gowns with red linings and would sit knitting, whilst singing to her budgerigar! She also had her own maids and liked to keep them in check! She was a firm believer in class distinction and came across as quite stern – sending them to church each Sunday and insisting they report back on the sermon subject and hymns chosen. After church, she’d send them out for a walk in Kensington Gardens, so they could watch the nannies and report back anything of interest. Herbertina’s health deteriorated in later life but she lived a full, interesting life. She died in 1919, aged 98. Further Reading: You might also find Mrs. Robinson’s Disgrace of interest!